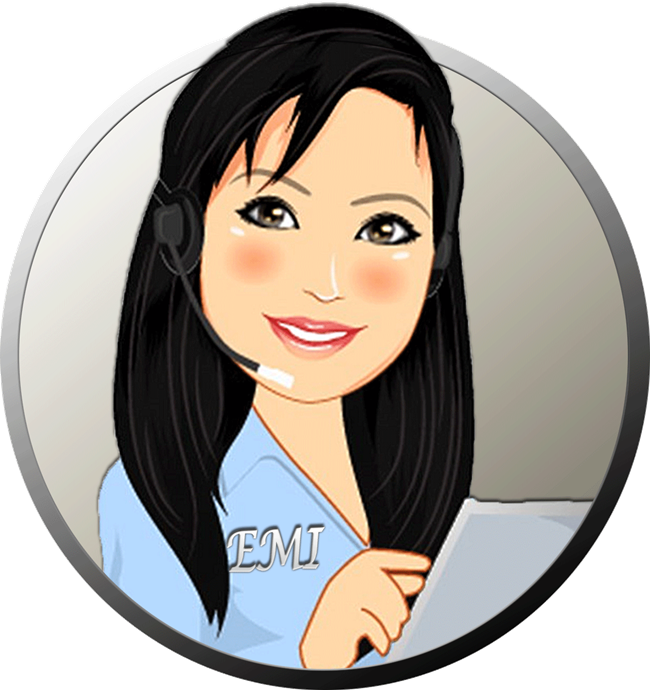 Calculator form will calculate any field that has been input by customer. My concern is the field amount will still be calculated if the customer choose to cancel by UNTICK the box (hidden field). Unfortunately the earlier input remains if it was not cleared manually. Is there a way to automatically clear the value or do not include the value if it was hidden? It's hard to explain it here, maybe the image will help. 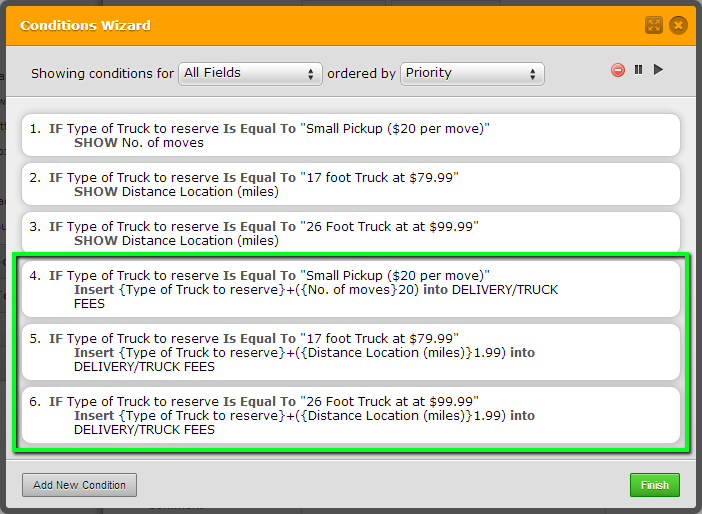 You would need to create additional conditions to change the calculation in the DELIVERY/TRUCK FEES field when the No. of Moves field is hidden. The same would apply to the Distance Location (miles) fields. I'll create a demo a little later to better explain what I mean. Due to the current limitations of the conditional wizard, the solution I had in mind won't work. 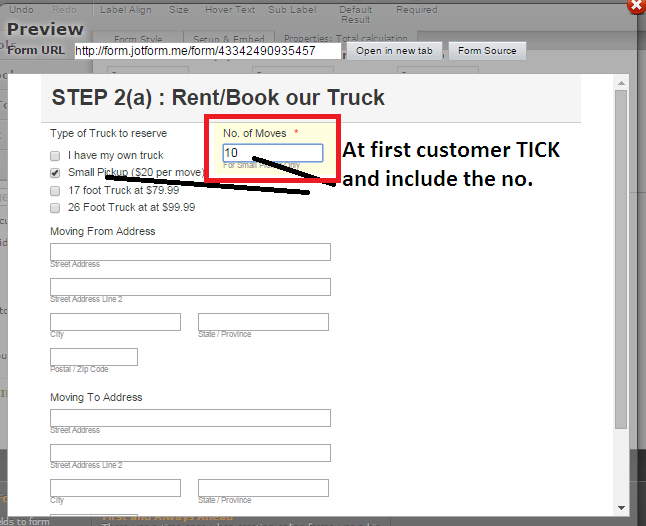 However, if radio buttons were to be substituted for the checkboxes in Type of Truck to reserve field, the solution would work, as demonstrated in this demo. As such, I would recommend that you delete the "Type of Truck to reserve" field in your jotform and replace it with a radio button one. Below is a screenshot of the summary of conditions in the demo but to get a better idea of its setup, clone it and carefully examine its settings. 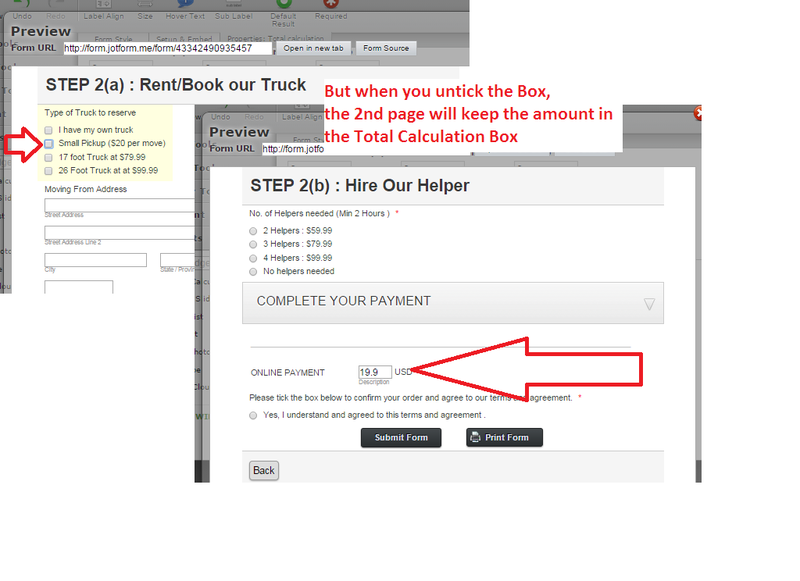 Also, if you clone the demo you'll discover that the "DELIVERY/TRUCK FEES" field is just a regular textbox. 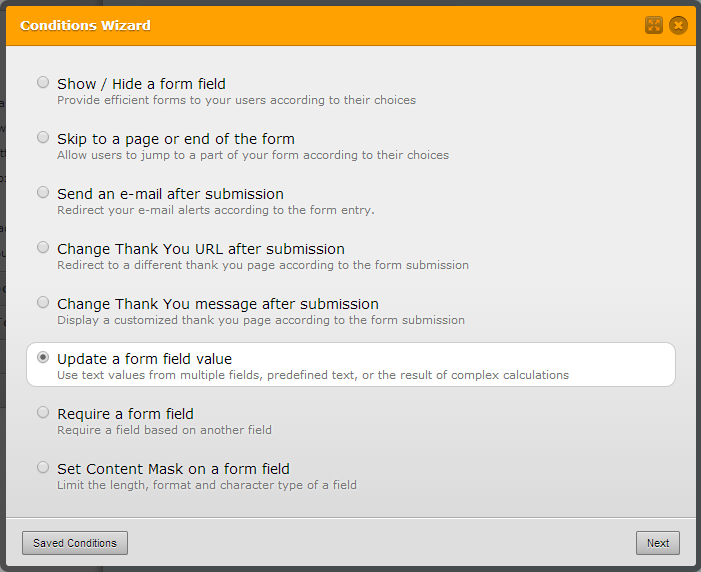 This is because when "Update a form field value" conditions are attached to calculation fields, they can't be set to read-only via those conditions. If you need clarification on anything, we'd be happy to help. Please do let us know if you have successfully resolve your problem using the workaround mentioned by my colleague. We'll wait for your response. Yes, it work very well. Again, you guys never stop to amaze me. In behalf of my colleague, you are most welcome. I'm glad that it worked for you.